The camera provides a great low light performance with its 26 LEDs. This camera is protected with a sunshield that makes it applicable for both indoor and outdoor use. Provides distinct color at day while delivering sharp B/W images at night. The packaging includes 2 foot video cable, power supply, tilt and pan mounting bracket and removable sunshield. 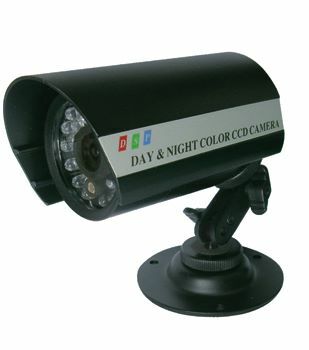 Non-stop surveillance with up to 45-50 feet area coverage. The CDS sensor auto detects LUX and turns on the infrared as needed thus ensuring prolonged lifetime of illumination circuit.